The Centers for Medicare & Medicaid Services (CMS) announced just before Thanksgiving that it utilized Civil Monetary Penalty (CMP) reinvestment funds to develop a three year program that will help with reducing adverse events, improve dementia care, and improve nursing home staffing quality. The tools launched on November 21, 2018 are focused on assessing staff competencies. 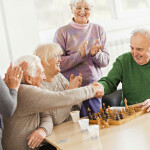 The idea is that once issues have been identified, nursing homes can apply for CMP funding to support quality improvement initiatives in these areas. Toolkit 1 includes the Nursing Home Staff Competency Assessment for multiple levels of staff, including CNAs/CMTs, LPNs/LVNs, RNs and management-level competencies for DONs, ADONs and Administrators. The topics cover behavioral, technical and resident-based competencies. The toolkit includes an Instruction Manual with additional resources. The next two toolkits – scheduled to be available Summer 2019 – will address nursing home employee satisfaction and how to improve it. View the Civil Monetary Penalty Reinvestment Program (CMPRP) program and download the toolkit items here.